Congratulations to Before the 90 Days couple Karine and Paul Staehle! Karine, who is currently 37 weeks pregnant, has received her US immigration visa! The news of Karine’s approval was seemingly confirmed by a photo of her actual visa (included above), which has been making the rounds online. 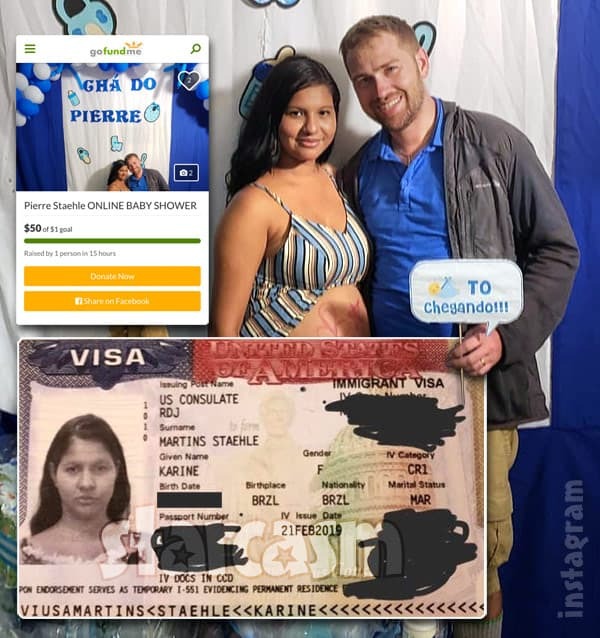 As you can tell from the photo, Karine received a CR-1 spousal visa, which is different than the K-1 visa that 90 Day Fiance fans are used to. According to the photo, the visa was issued on February 21. A CR-1 visa is an immigrant visa that allows a spouse of a U.S. citizen to enter the U.S. as a Conditional Resident (hence the abbreviation, “CR”), if they have been married for less than two years. A sponsor files for a CR-1 visa by submitting a Petition for Alien Relative, Form I-130. To be eligible for a CR-1 spousal visa, the U.S. petitioner must be a U.S. citizen or lawful permanent resident who is at least 18 years old. The petitioner must also be legally married to the alien beneficiary and meet certain minimum income requirements set by the USCIS. Like many Before the Days fans, I’m curious how Paul was able to “meet certain minimum income requirements” given his rather infamous lack of income. By all accounts, Paul and Karine are filming for TLC again, so perhaps they got a bit of a raise? At the time of this post, the GoFundMe had a single $50 donation, but there was a comment saying the person was sending $500 — I assume that was via PayPal. As mentioned above, all evidence suggests that Paul and Karine are filming for TLC again, but it is still unclear for which show. Given their particular situation, they do not seem to be a fit for any of the existing or newly announced concepts. The fact that Karine has received her CR-1 visa means that there is no 90-day caveat for her visa, so the original flagship series 90 Day Fiance and the first spin-off Before the 90 Days seem like a bad fit. TLC announced last year that they were filming a new spin-off titled 90 Day Fiance: The Other Way featuring US citizens willing to move abroad for love. Karine receiving a US immigration visa would seem to clearly indicate that it is her intention to move to the United States, and not for Paul to move to Brazil. There is still the possibility that the couple could find a home on 90 Day Fiance: Happily Ever After. Although the series has always been a way to continue sharing the stories of couples married on 90 Day Fiance, there is nothing that says a couple can’t hop directly from Before the 90 Days to Happily Ever After, right? I suppose we will all just have to stay tuned to find out!